The Council for Higher Education Accreditation (CHEA) International Quality Group (CIQG) has named Conestoga a recipient of the 2018 CIQG Quality Award. 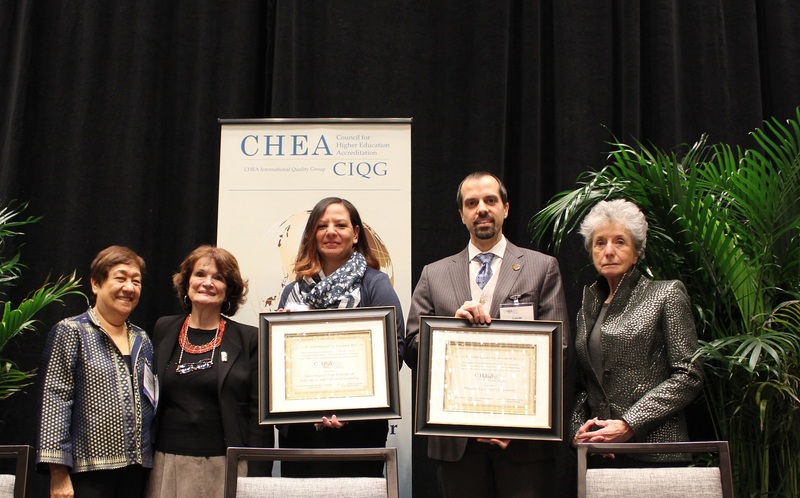 Established in 2018, the award recognizes outstanding performance of higher education providers in meeting CHEA/CIQG’s international quality principles. Sacha Burrows (centre), Conestoga's manager of degree quality, accepted the 2018 CIQG Quality Award on behalf of the college in Washington on January 31. "The award is a celebration of good practice and a demonstration of the major stake that higher education providers have in improving quality around the world," said Concepcion Pijano, an international consultant on accreditation and chair of the CIQG Advisory Council. Sacha Burrows, Conestoga's manager of degree quality, accepted the award on January 31 at CIQG’s annual meeting in Washington, D.C. where the college was celebrated as one of two inaugural recipients. To demonstrate its performance in meeting CIQG’s quality principles, examples were drawn from Conestoga’s Bachelor of Engineering - Mechanical Systems Engineering program. It was the first college program in Ontario to be accredited by the Canadian Engineering Accreditation Board, and is delivered using project-based curriculum and increasingly complex real-world projects. Conestoga continually improves programming through the ongoing implementation of quality assurance measures and processes. These include the Conestoga Continuous Quality Improvement initiative, yearly academic program reviews, and the establishment of Program Advisory Committees (PAC), among others. PACs include industry partners and academic advisors who ensure trends from both perspectives are discussed and incorporated into program designs, where appropriate. Reviews of Conestoga’s programs are also undertaken by the Postsecondary Education Quality Assessment Board and the College Quality Assurance Accreditation Process. CIQG was established to engage quality assurance and accrediting organizations internationally toward creating and promoting core principles for quality in higher education. The CIQG Advisory Council, a group of 20 higher education and quality assurance experts and leaders, is responsible for naming recipients of the award. To be eligible, a higher education provider must be successfully reviewed for quality or accredited by the competent authority in its country or region. Visit CIQG for more information.